In less than 12 hours, a fridge called Phil will be touching down on Comet 67P/Churyumov–Gerasimenko. Of course that's nonsense, but in less than 12 hours, a fridge sized lander called Philae will be landing on the aforementioned comet as part of the European Space Agency's Rosetta mission. The mission will analyse the comet and do all kinds of interesting stuff. 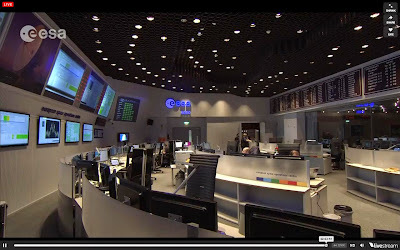 Find out all the latest, including watching the mission control room, at http://rosetta.esa.int/ - to be honest it's not that exciting, but I think everyone's been clearly briefed about the webcam - everyone looks busy (although you can't see their screens so they could be playing Solitaire) and they do seem to surreptitiously glance at the webcam when passing near it. And there appears to be music playing, I don't know if the music is actually playing in the control room or if its to replace whatever noise there is in the room, I assume that it's much like any other workplace and there's the danger of someone within the range of the webcam complaining about a co-worker, eating a bacon sandwich, or swearing when they realise that they forgot to charge their smartphone, so not transmitting sound is probably a good idea. Nevertheless, I'm doing my best to piece together what's going on. There's a guy in a suit who walks around - I think that he's a boss of some sort, perhaps making sure that the mission will achieve its agreed objective of landing on a chunk of ice. Then there are some guys with shaved heads with headsets on. I think that these are possibly telesales operatives selling secondhand fridges, as I presume prior to launching the mission they probably used a lot of fridges to see how to crash one into a comet without breaking it - they're probably a lot cheaper to damage than a space science probe. There are also some other guys also wearing headsets but with hair. I think that these are IT technicians because I've seen them at least once get under a desk, which in my experience means that they are computer techies fixing the network or plugging in a USB cable or some such thing. Finally there is one other quite young guy with hair, glasses, and no headset. He's clearly a trainee who perhaps is on day release from the local college, and I'm surprised that I haven't seen him bringing anyone coffee yet. So do head over to the website at about 8.30am GMT when I expect the room will be a lot fuller as they do the rather challenging task of landing a fridge probe onto a speeding chunk of ice by remote. Seriously though, all the best to the ESA with this incredible mission! Ah, I remember the days when America would send refrigerators to space, now we send glad handers to Washington. You have to keep me briefed on the progress, I need to know. There is a Lot of information on your blog. Liked it so much.